When I Hear Her I Have Wings, Hard Times Come Again No More, Somewhere Over The Rainbow, All of Me, The Steady Light. Four of the pieces were either written or arranged by members of MEN. The songs are all from our concert sets over the last 3 years. 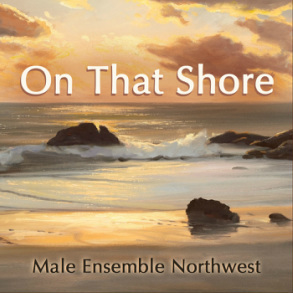 ﻿This album, recorded in 2007, is mostly a collection of songs either written by MEN members or songs written especially for the ensemble by others. This album includes a wide variety of genre from the Celtic Songs of Vijay Singh, all the way to arrangements of tunes by the Beatles. Eleanor Rigby and Irish Blessing. MEN's "tribute" album contains arrangements and original compositions by one of the most renown of American choral musicians, Norman Luboff. Luboff, one of the great American choral conductors and arrangers was the inspiration for many aspiring choral directors. His many albums, including: "Songs of the West," "Songs of the South," and "Songs of the Sea," are well worth revisiting for their warmth and richness of harmony, especially for the male voice. This group's first recording is called Promised Land (Songs of America). Reviewer Jerry Weseley Harris sums it up by saying, "(this) is an important addition to the choral music library of all people who enjoy a variety of choral literature presented with the highest standards of choral artistry." The album is divided into the following groups: American Hymns, Spirituals,Songs of the Civil War, Songs of the West, Songs of the Sea, and American Television Themes. Harris was so taken with the humor and skill shown in the TV themes medley he said this alone was worth the price of the album. Order your copy of MEN recordings!